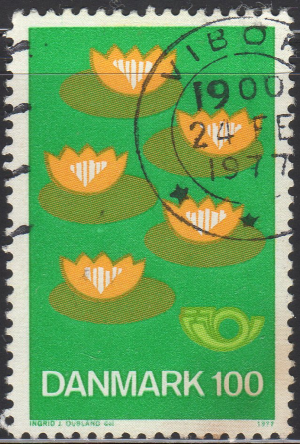 Always on the lookout for color varieties, I came across some variation in the Denmark 1977 Water Lily’s stamp from the Protection of the Environment set. 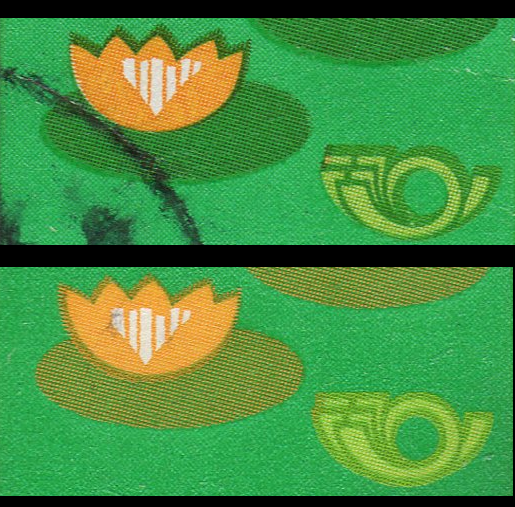 The color difference appears seems to show missing or underinked green coloring on the lily’s as well as the posthorn. My copy of the correct color stamp is a bit damaged unfortunately, but I have 2 copies of the stamp with the color difference. This is likely a common variety. Here is the full stamp with the color difference. Note the color of the Lily’s as well as the shading around the flowers and the posthorn. Not sure what caused this difference in color, but it is an interesting variety. Did you check the stamps under UV? 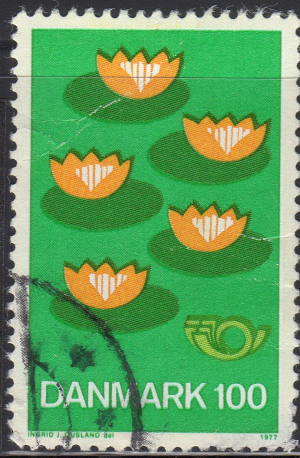 At least the Finnish stamps of same design were printed on regular and phosphorous paper (with different gum). Since all these stamps were printed on Finland (even for Denmark, Sweden Norway and Island), the thought/possibility of different papers is to first come up. Good idea – I will check under UV. Facit says the recess printed “frame” is fluorescent. Fluorescent check comes up empty. They all look the same under UV light. Just checked AFA Special catalog; nothing about the difference in there neither. Just two different gums (for both values) the same way as in Facit.